This exceptional 18 hole course was designed by one of the UK’s leading course architects, David Williams and was commissioned by Penrhos founder and current director of the family owned Park and Golf Club, John Pugh-Evans. Penrhos Park has a fully stocked golf shop just in case you need anything and we also hire out motorised golf carts and trolleys. The complex also boasts a 9 hole course and a floodlit driving range for those who like to fine tune, hone and practice practice practice. 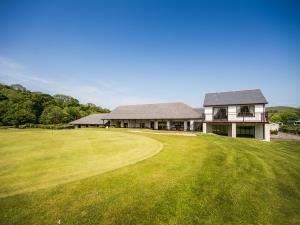 Penrhos Park is a no-expense spared, high quality holiday destination for all the family but designed with the golfer in mind. The Country Club is light and airy and includes a landscaped indoor swimming pool and leisure complex. The same high standard of design and finish have been carried through to the hotel, providing an unrivalled holiday choice. With all the activities on offer - from swimming pool, tennis, sauna, solarium, gym, a challenging 18 hole championship golf course, bowling green, country walks and more - won't you be too busy to cook? The Fairways Restaurant is one of two on the site and overlooks the 18th green. You can choose from an extensive menu of classic and modern mouth-watering dishes, full Welsh breakfast and great dinners served in the Penrhos Grill restaurant overlooking the swimming pool.